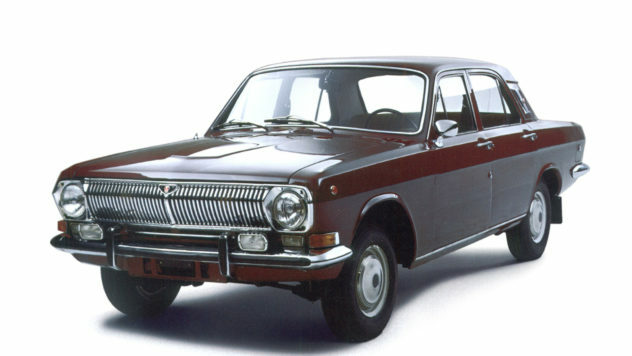 Throughout the Soviet world, Volga cars were seen as a high status symbols, used by party officials, the nomenclature, and security services. 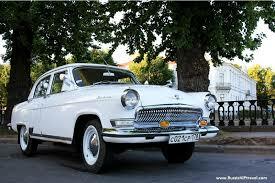 Also all Volga cars traditionally were used as taxi cabs, road police interceptors and ambulances. Today, Volga cars are seen as large and inexpensive family sedans. Cars under this GAZ 21 name have been in production since 1956. There are 3 major generations: M21 (1956–70), M24 (1970–92, over two minor generations) and M31 (since 1982, in various versions). GAZ-21: The GAZ M21 Volga, the first car to carry the Volga name, was developed in the early 1950s. Volga’s were built to last in the harsh climate and rough roads of the Soviet Union, with high ground clearance, rugged suspension, strong and forgiving engine, and rustproofing on a scale unheard of in the 1950s. The Volga M21 was the most luxurious car any Soviet citizen was permitted to own.The car’s large size and tough construction made it popular in the police and taxi trades, and V8-engined versions were produced for the KGB secret service.Today, the M21 is considered a motoring icon with fans all over the world, including at least a handful in the USA . GAZ 24: The GAZ-24 Volga entered limited production in 1968 and with a two year switch from M21 to M24, full-scale manufacturing began in 1970. GAZ-24 production continued with many modifications and improvements until 1992 with the M31 permanently replacing it. This Volga enjoyed moderate success in export markets, and is the best-selling model in GAZ history with over 600,000 made. During the 1960s-80s the Volga was also assembled in Belgium, with the model M21 at first. This took place at SA Sobimpex, NV, in Brussels. The cars came to the harbour in Antwerp without engine and with the gearbox, disassembled, in the boot. At Sobimpex they initially built in a Perkins Four-99 diesel engine. Later on the Perkins diesel engine was succeeded by a Rover engine, which was succeeded for the GAZ-24 by an Indenor engine from Peugeot; the model now gained the designation “D”, for Diesel. Almost all GAZ passenger cars introduced since the 1970s are based on the venerable GAZ-24 platform, right down to the central body shell. In the 1970s, Volga also introduced a convertible “24” model which had a limited, but very successful run. Volga car production was always very limited, and about 90% of them were sold to different organizations right on the assembly line, so one had either to wait for years to by a Volga or to get a special permit. Mostly because of this, Volga cars were cared by their owners with great love. Engines were: 2445 cc (150 c.i.) 95-100 hp I4 with 4-speed manual and 5530 cc (340 c.i.) 195 hp (145 kW) V8 with 3-speed auto, V8 version was produced in very limited numbers and used primary by the KGB and road police. Power drum brakes were standard, power steering was standard on V8 cars. The car was equipped with AM-FM transistorized 3-wave radio with power antenna, heater with defroster, rear window defogger, front and rear central armrests, front and rear seatbelts (since 1977), electric clocks, 2 windscreen washers, instrument panel safety padding, padded sun visors, door-to-door carpeting, trunk and glove compartment lights. Custom-built cars were equipped with air conditioner, tinted glass, custom interiors, power windows and additional chrome trim. The GAZ-24-10 (an improved version of GAZ-24 with many changes in appearance, engine, suspension, brakes, etc.) was produced from 1985–92. An estate, the GAZ-24-12 Universal, was also produced. 24-10 was sold to private owners without any restrictions, though the price was still rather high. GAZ-24-10 is also known as the third generation of GAZ-24. GAZ-31xx: The model numbers of 31xx series conform to a new model numbering system adopted in the USSR at the time. GAZ-3102: A restyled, improved and more luxurious version of the GAZ-24 with 105 hp (78 kW) engine, the Volga GAZ-3102, arrived in 1982 and continues in production to the present (with new engines: ZMZ-406, 4 cyl., DOHC, 2,3l, 130 h.p. ; or Steir 4 cyl. diesel; or Chrysler, 4 cyl., DOHC, 150 hp (112 kW), totally new interior and improved suspension.) Front disk brakes became standard, as well as 3.9:1 rear axle and many other improvements. Again, V8-powered limited production version existed, called GAZ-31013, engine and transmission remained the same with only minor modifications. 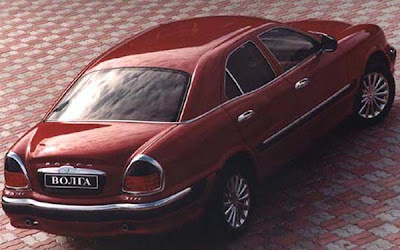 Also, in mid-1990s there was a limited production version with Rover V8 3,9L engine. Before 1991, the Volga 3102 was not sold to private owners because it was built exclusively for government organizations. 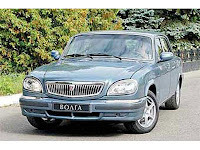 Since the early 1990s, 3102 is positioned by GAZ as a luxury saloon and costs slightly more than a standard Volga, and it is often mentioned that production quality of 3102 Volgas is slightly better than for other GAZ cars. GAZ 31029: The Volga 31029, featuring more aerodynamic front bodywork, was produced from 1991–97. Its reputation is rather poor because of rust problems and poor quality. A 31029 was featured as a getaway car in the 1995 James Bond film GoldenEye. GAZ-3110: A more modern derivative of the GAZ-31029, the Volga GAZ-3110, arrived in 1997 and remained on sale until 2003. The estate version of the 3110, the Volga 310221 Universal, remains in production as of 2007. The saloon received a minor front restyle for the final year of production, while the estate continued with the 1997 front styling, with everything from the A-pillar back dating to 1972. The 3110’s replacement, the Volga 31105, entered production in early 2004 and represents the most heavily restyled and modernized version of the GAZ-24 yet. In addition, even more heavily restyled GAZ-24 versions in both saloon and estate form are planned for the near future. 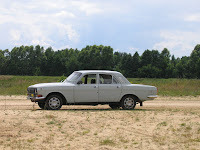 GAZ-3105: Besides the GAZ-24 derivatives, GAZ has also produced two truly modern Volga models in recent years. The all-wheel drive Volga 3105 luxury saloon powered by the all-new OHC V8 engine was produced in limited quantities (primarily for experimental use) from 1994–97, when production ceased after only a few hundred had been built. GAZ-3111: The 3105 was succeeded by the rear-wheel drive Volga 3111 produced from 1998–2003. The 3111 was a modern luxury saloon targeted against used western cars on the ex-Soviet market. It featured GAZ M21-influenced retro styling cues and was developed in collaboration with US-based Venture Industries. Though very modern in appearance and packaging, the 3111 still used some parts from 1967-presented M24. 3111 production ceased after a short run caused by high production costs, and lackluster sales due in part to the car’s uncompetitive $8,800 base price. GAZ-31105: The GAZ 31105 Volga entered production in 2004 as a replacement for the one year-only Mark II version of the 3110. The car features a more heavily revised front, with a grille and headlights inspired by the modern, but discontinued, 3111. New, more conventional looking, body-coloured door handles were also instituted. The 31105 is available only as a saloon, with the estate continuing with the old 3110 styling. What is to become of the Volga? GAZ, announced that production of Volga passenger cars would be phased out over a 2-year period, with production to end in 2007. GAZ stated that they would instead concentrate on their more profitable truck, bus, and commercial vehicle businesses. At the same time the announcement was made, GAZ also introduced the Volga 311055, a long wheelbase derivative of the 31105. However, in the summer of 2006, GAZ reversed its earlier decision, announcing that further investments would be made in upgrading the styling and technology of the Volga sedans, keeping them in production as “retro” or “historical” vehicles. In early 2006, GAZ signed a deal with Daimler Chrysler to acquire the tooling and intellectual property rights for the Dodge Stratus and Chrysler Sebring mid-size cars, which will enter production in Russia, but under GAZ Siber brand, not Volga. GAZ owns the car’s platform outright, allowing all-new future vehicles to be developed on the same underpinnings.